The Atex certified four load cell weight detection IP68 guarantees the best accuracy in all work conditions. - Maximum lifting capacity: 2500 kg. - Accuracy: +/- 0.05% of the maximum capacity. - Fork dimensions 1150 x 550 x 85 mm. - Weighs about 125 kg. - Bearing structure in extra thick sheet steel and oven-fire painted interior construction. - Standard fitted swivelling column head. 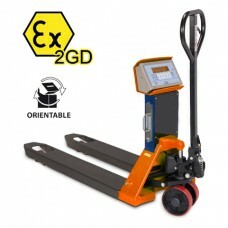 - Steering wheels and double loading rollers with a poliurethane coating. - Atex certified, 4 stainless steel IP68 shear-beam load cells. - Indicator with easy to clean satined stainless steel case with IP68 enclosure built to withstand humid and dusty environments; large LCD display 25-mm high contrast digits which are clearly visible even in poor lighting conditions; 17-key numerical/functional membrane waterproof keyboard. - Calibration and Set-Up parameters configurable from keyboard. - Power supply through extractable battery, rechargeable in safe zone. - 150-hour approximate operating time.